It is always interesting when Saints visit a new ground – especially one paid for by the British public. Both sides made a couple of changes: Reid was back from injury and Alonso was making his debut for West Ham. Saints brought in Hojbjerg and Austin for Clasie and Long. The match began with a blizzard of bubbles emanating from those poxy machines. After a tentative start, West ham launched a long ball down field for Zaza. Our defence forced him to rush his shot which missed the near post. Our first attack of note saw Tadic getting down the right but his cross was cut out. Then Bertie made the first of many runs behind the Hammers’ defence. He tucked his cross back for Hojbjerg but the young Dane took too long getting his shot away and it was blocked. Saints were already enjoying good pressure. On 9 minutes Romeu brought down Lanzini and was booked. A minute later Fonte gave the ball away letting Antonio in to shoot but it went wide. West Ham’s next attack saw a cross come in from the left which Davis headed behind. The corner was cleared to Redmond but he lost control of the ball in a promising position. On 15m Tadić was fouled. The free kick fell to Davis but his strike went straight into the keeper’s gloves. Then Zaza got into Saints’ box but Fonte and Cedric dealt with the Italian, whose elaborate fall to the ground was ignored by Mr Moss. The game was still tight but Saints were looking the more adventurous. Bertie was getting forward well but also keeping a tight rein on Antonio when required. A number of promising Saints moves were undone by poor final passes. West Ham then enjoyed a short period of dominance. A couple of free kicks were put into our box and we made a meal of clearing the ball. The danger ended when Zaza chased a ball out of play, claimed a corner but the Ref said goal kick. Charlie Austin was making plenty of decent runs but the ball either never arrived or, as on 28m, sailed high over his head into touch. A minute later Saints got down the right and delivered a better cross for Charlie, only for Adrian to come and claim it. Another foray by Bertie won a corner which West Ham cleared. Down the other end Lanzini got into a good crossing position but sent the ball yards over the bar into touch. Then Kouyate put in a dangerous cross which Virgil headed behind. Payet’s corner was cleared by Højbjerg. On 40 minutes Bertie made another burst down the left, running onto Tadić’s pass. Looking up he saw Austin hanging back as the defence retreated. Bertie rolled the ball in and Charlie swung his left leg and tucked the ball into the far corner: 0-1 and Austin’s 5th goal in 4 games! 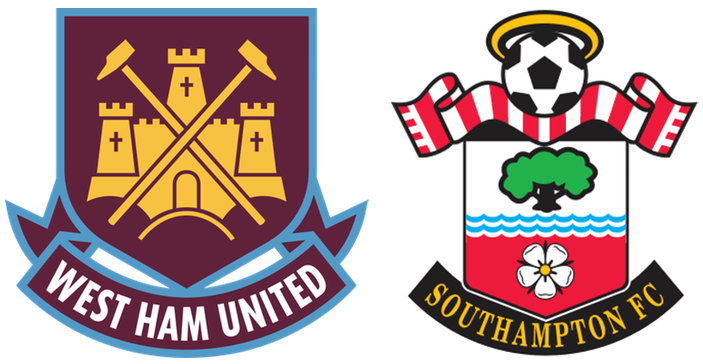 Saints enjoyed plenty of possession after the re-start and might have buried West Ham by half time. Bertie ran their defence ragged at times. Redmond controlled a cross before forcing a save from Adrian; then Cedric broke into the box but put his shot into the side netting. West Ham eventually gathered some composure and in the added minute won a corner. Saints cut out Payet’s corner as Jon Moss blew for half time: 0-1. Bilic replaced Lanzini with Feghouli for the second half but play was soon held up while Kouyate received treatment. When play resumed it was again Saints on the front foot. On 50m Charlie was fouled. Tadić sought the head of Virgil but the ball was headed away. Saints recovered possession and a right wing cross found Højbjerg. The Dane tried to loop his header over Adrian but the keeper was tall enough to claim it. Saints continued to tear into the home side. A delightful back header by Tadić found Cédric running beyond. The full back returned the ball to Tadić whose shot was deflected for a corner. West Ham cleared the cross. On 54m a rare foray forward saw West Ham put a cross into the box but Fonte headed away. Hojbjerg won possession but was upended by Noble’s studs-up tackle - for which the skipper was booked. Saints were soon back attacking but Ogbonna out-muscled Redmond allowing West Ham to break. The attack was halted by the cleanest of tackles from Fonte yet Jon Moss awarded a free kick. Payet pumped it forward but Virgil headed away. On 59m Zaza was booked for diving then, down the other end, Redmond latched onto a long ball down the left. He turned the ball across the box but, for once, Charlie had not followed up and was not there to turn it in. Saints 2nd was not long in arriving though. West Ham clumsily lost possession allowing Steve Davis to find Charlie to his right. The striker’s first time pass found Tadić breaking into the box. The Serb sold an outrageous dummy to Adrian and rolled the ball into an empty net: 0-2. Saints were well on top and “Oh When the Saints…” rang round the stadium. Bertie and Redmond worked an opening for Davis but his shot went high. West Ham’s next attack saw Virgil booked for a foul. From the resulting free-kick, Cédric was obliged to concede a corner. Payet’s cross found a West Ham head but the ball sailed wide for a goal kick. Tadić then worked another opening for Davis but his shot was blocked. West Ham then took off Nordveit bringing on young Fletcher, on loan from Man Utd. West Ham then enjoyed a period of possession during which a shot deflected off Bertie for a corner. West Ham bitched about “handball” surrounding the referee and earning Arbeloa a booking. The corner was safely cleared. Then Payet engineered a shooting chance but dragged his effort wide. On 74m Saints withdrew Austin and brought on Long. A minute later, Redmond was played in and his shot was blocked by the keeper and, eventually, hacked clear by his defence. On 77m West Ham managed their only effort on target. Payet fed Zaza and the Italian’s shot went past Fraser – but not Virgil who booted it off the line. Saints broke downfield and Long set up Tadić whose feeble shot was cleared. Then West Ham won another corner which was knocked away but recovered by Reid. The defender controlled it before driving a truly awful shot into the crowd. On 80m JWP replaced Tadić. Shortly after, Reid was booked for a foul on Long. Reid atoned by heading JWP’s free kick away. Saints’ next attack saw the ball crossed for Højbjerg. He struck a screamer past the post but scored a direct hit on one of the TV cameras – Ouch! West Ham’s last change saw Fernandes replace Noble. Saints’ back four continued looking imperious and our centre backs had won virtually every ball played into our box. A foul by Long gave West Ham another opportunity but it was cleared again. Saints were soon in the other box looking for a third. First Cédric set up JWP but Adrian saved his shot. Then Long played in Højbjerg whose fierce cross shot was tipped round the post – for a goal kick FFS! Puel gave Cuco Martina a birthday present by letting him replace Cédric for the last few minutes. On 89 minutes Payet was also booked for diving – a sign of the desperation he must have felt, perhaps. The 4th official hoisted 4 minutes on his board as OWTS again rang round the ground. In the 2nd of these, Redmond sent Davis darting down the left. His cross hit a defender – but fell nicely for Ward Prowse. The youngster tucked it neatly into the corner for his long-awaited first Premier League goal from open play. Well done nipper – 0-3 and the home fans got up and left. Before the final whistle Saints fans sang “We’ve got more fans than you” and by then it may have been true. Jon Moss brought the match to an end. Saints had won 4 consecutive games without conceding a goal. That is much more like it! MoM: This is a tough call because most of our team played well. Despite fine performances all over the park I’m nominating Højbjerg. He started slowly but grew into the game. He then effectively ran the second half for Saints.